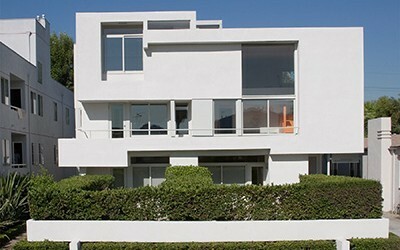 Since its founding in 1994, the MAK Center for Art and Architecture at the Schindler House has been making a unique contribution to the artistic and cultural landscape of Los Angeles. Offering a year-round schedule of exhibitions and events, the MAK Center presents programming that challenges conventional notions of architectural space and relationships between the creative arts. 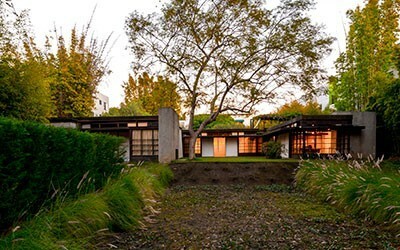 It is headquartered in the landmark Schindler House (R.M. Schindler, 1922) in West Hollywood; operates a residency program and exhibition space at the Mackey Apartments (R.M. Schindler, 1939) and runs more intimate programming at the Fitzpatrick-Leland House (R.M. Schindler, 1936) in Los Angeles. The MAK Center is the California satellite of the MAK — Austrian Museum of Applied Arts / Contemporary Art in Vienna, and works in cooperation with the Friends of the Schindler House. Unique in its role as a constellation of historic architectural sites and contemporary exhibition spaces, the MAK Center develops local, national, and international projects exploring the intersection of art and architecture. It seeks out and supports projects that test disciplinary boundaries. Acting as a cultural think tank for current issues, the MAK Center encourages exploration of practical and theoretical ideas in art and architecture by engaging the center’s places, spaces, and histories. Its programming includes exhibitions, lectures, symposia, discussions, performances, music series, publication projects, salons, architecture tours, and new work commissions. It collaborates frequently with guest curators, artists, and architects. The Schindler House, designed by modern architect and Viennese émigré Rudolph M. Schindler, is considered one of the world’s first modern houses. It has influenced and inspired generations of architects worldwide. It redefined notions of public and private, and indoor and outdoor space; and broke new ground in the design and construction of the modern dwelling. Schindler and his wife Pauline regularly hosted artists, musicians, poets, writers, and actors, and so their home quickly turned into a center for avant-garde art and inquiry. Today, the Schindler House is regarded as one of Los Angeles’s most beloved architectural and cultural landmarks. It is the MAK Center’s mission to preserve and promote Schindler’s architecture and continue his and Pauline’s legacy of artistic and cultural experimentation.